Heath will probably kill me for telling you guys about his mishap with poison ivy, but it’s a good story to tell if someone else learns to avoid it! Sorry, Heath! Anyway, back when we first started dating, we would spend every weekend going on camping trips. Heath had to go to the bathroom, and when you’re out in the woods, you usually find a tree to park yourself by, dig a hole, and squat down to take care of business. Well poor Heath apparently did not realize that he had parked himself in a big patch of poison ivy! He had forgotten to take some toilet paper with him and grabbed a big clump of leaves and wiped himself with them! Shortly after he returned back to the campsite, the look on his face was sheer panic. He knew something was wrong but still hadn’t realized exactly what he had just done. I took a quick look at his rear end and immediately knew what the problem was. I hate to say that I laughed, but I did. He had been trying so hard to impress me and show off his “outdoorsman skills” and instead he ended up with the most horrible poison ivy rash I’ve ever seen. So the moral of the story is, be aware of your surroundings and know how to identify this particular plant! 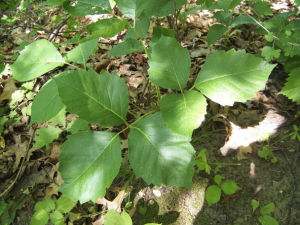 Coming into contact with poison ivy is a miserable experience and can ruin your entire excursion. We ended up leaving and going home that day so we could get Heath some relief. It took almost a week to clear up. Poor guy! Stay away from poison ivy!